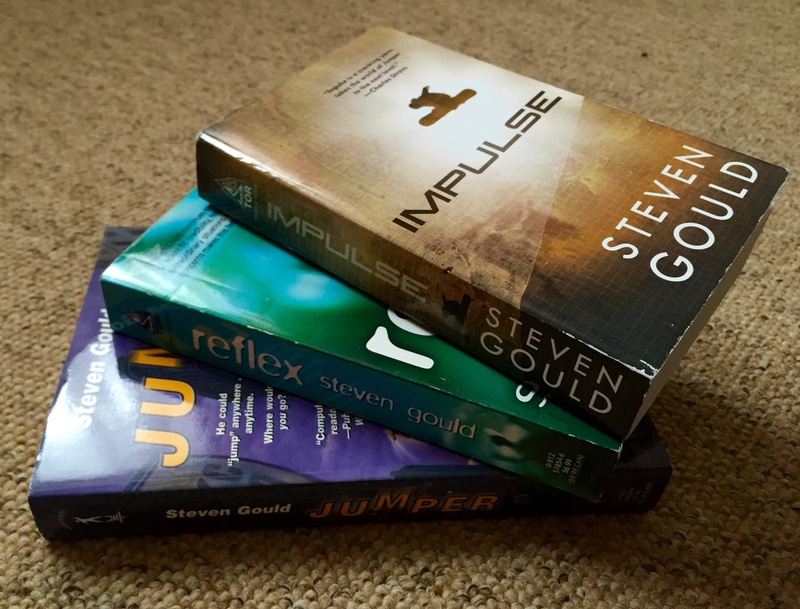 Last year I reviewed Impulse, the third book in the Jumper series by Steven Gould. I’ve just finished Exo, the fourth. Yes, I’m still a way behind in my reading. As in Impulse, Exo follows the activities of the Rice family: parents Davy and Millie, written in third person, and their 17-year-old daughter Cent, in first person. All three have the ability to jump – teleport – from place to place, subject to some plot-enabling constraints. In my review of Impulse I suggested Gould seemed to be moving pieces around in preparation for something bigger, and Exo is definitely that. I wasn’t expecting quite how big. Impulse was Buffyesque: teenage girl with powers has to deal with school, boys, villains, etc. Exo has more ambition. The scope is not local, but global. Exo is about a young woman taking control: knowing (mostly) what she wants, and setting out to get it. Emerging from the shadow of her parents, from the shadow of their necessarily secret lives – they have enemies, trailing them through the books, who’d rather see them dead than jumping. What does Cent want? Consider this: she can jump to places she can see or has visited. She can also jump “in place” adding velocity. So she can jump up, and keep going, adding bursts of speed to counter gravity, and then she can jump instantly back to where she started – and then instantly back to where she ended up. With the necessary equipment, how far up could she go? And what could she do when she got there? And of course: what happens when, inevitably, she’s tracked? Cent is a convincing protagonist, albeit implausibly bright. She still has to endure late-stage teenagerism with its embarrassing parents and boy-related awkwardness, even as she steps and/or jumps towards adulthood and the accompanying Stuff. I’m pleased she’s not the only focus: the many chapters following Millie and Davy broaden and support the story, linking it to the previous books and showing more of that Stuff. For example, Millie’s mother is very ill in hospital – and they suspect their enemies know, which brings obvious and non-obvious complications. Gould doesn’t skimp on the technicals. Exo is a little heftier than its predecessors, and much of that seems down to the fine detail, the research brain-dumps he scatters throughout the story. Perhaps these are intended to appeal more to the teenage boy audience, to balance the female protagonist viewpoint. I know my proto-nerd self would’ve lapped up every nut and volt. It doesn’t feel like padding, slowing the story down. Instead it grounds the story in the real world: despite all the jumping you still need X and Y, and you still can’t do without Z.
What’s missing, curiously, is any great sense of threat beyond the dangers Cent experiences as a natural result of her ambition. The Rice family’s enemies are always in their thoughts, and Davy especially is constantly on his guard fretting about attack vectors, and that’s mostly as far as it goes. Not entirely. Perhaps that’s a more realistic approach than an attack-of-the-chapter style, which would only submerge the main plot in treacle. The reader wants to know what Cent does next, and that’s enough to keep the pages turning. Exo marks a change in the Jumper series. The previous books were about dealing, struggling, adjusting, fighting. Exo is about owning and achieving. It’s positive, it’s progressive, and you’ll wish it were true. On the flip side, I’m not sure where the series goes after this. At least if it ends here, Exo is a fine conclusion. In the first Jumper novel we met Davey, a teenage boy, who discovered he could teleport — he called it jumping — under certain circumstances, and to certain places. This was a Pretty Neat Trick, and unsurprisingly one that authorities of various kinds wanted to exploit. Jumper and Reflex explored Davey’s adventures. He got older and fell in love, discovering he wasn’t the only jumper along the way, and learned jumping has physical limits. In essence he reverse-engineered the physics of jumping, and it wasn’t the get-out-of-jail-free card it might have seemed. In Impulse, with the Jumper universe well established, we return to Davey and his other half Millie a couple of decades on (Jumper was published in 1992, so we’re still present-day). The pair have lived in hiding all that time, jumping discreetly and in disguise, and they now have a daughter, Cent, in her mid-teens but lacking any social existence. She’s been home-schooled all her life, and she and her parents have come to realise that’s more of a non-life. So they work out a way for her to attend a real school. Naturally being highly educated, paranoid and the new girl, Cent attracts attention. It’s no real spoiler to reveal she discovers she too can jump. And as she masters the technique she figures out how to do more – all logical within the established universe. Jinks both high and low ensue. Meanwhile her parents carry on with their humanitarian activities (being able to bring fresh water into disaster areas without the usual hassles, for example, is a tremendously useful skill). Although the focus is mostly on Cent – first-person, strong teenage female protagonist alert! – we also follow Davey and Millie (in third-person). In the three Jumper books I’ve read so far Gould has wisely resisted the temptation to give more and more characters the ability to jump. In Alfred Bester’s classic The Stars My Destination anyone can learn how to do it (Bester calls it “jaunting”, the same word used in the cardboard’n’flares 1970s TV show The Tomorrow People). Although the imagery of thousands of people bamffing into existence to gawp at a current event is beguiling, it’d soon lose its impact in the Jumper books. When everyone can jump, jumping is boring. Impulse is, I’d say, less of a YA thriller than its predecessors – it’s more of a coming-of-age story with an SF twist – but just as compelling. The female teenage protagonist is great to see, even if my hunch is it may deter the stereotypical teenage boy from picking up the book. A shame if so – there’s plenty to enjoy. Like Jumper and Reflex, Impulse is very much one of those books you read with an inner sigh, wishing you had the same power. Fancy a day skiing? Some authentic Chinese food? Easy. Right now, I’d jump to somewhere I can get my feet warm. Rio seems nice.